A number of cobras, including this 3-foot-long true “spitter,” have developed a remarkably effective way of deterring potential disturbers without getting close enough to be damaged. Each of its two hollow fangs has a small cup near the exit of the central canal so that the venom does not just pass straight out but curves, as in a turbine bucket, into an outwardly directed stream. The Spitting Cobra may open its mouth and by suddenly compressing the venom glands, send twin jets of venom toward the eyes of a cat, antelope, or man. The venom, which can be sprayed a distance of 8 feet, is absorbed through the membranes of the eye, blinding the recipient – at least temporarily. This cobra ranges far across the African continent except in the extreme south, in some deserts, and in the deep rain forests of central and western Africa. Like the other true cobras the Spitting Cobra lays eggs. 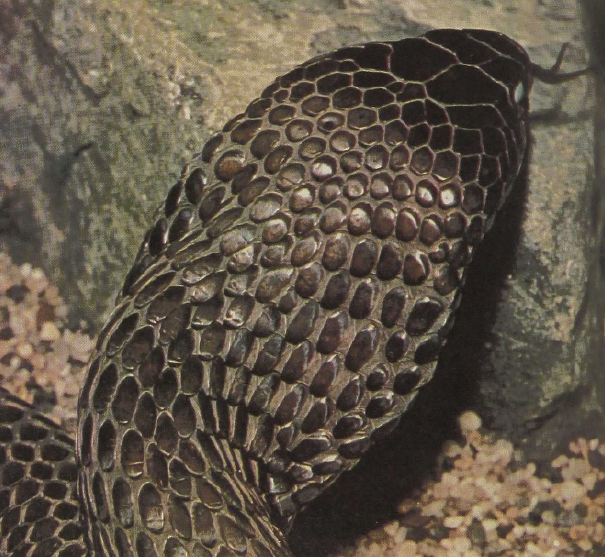 In contrast, the Ringhals, a cobra relative, produces live young.